AgroAtlas - Crops - Lotus corniculatus L. - Birdsfoot trefoil, bird.s-foot trefoil, upright trefoil, common lotus. Lotus corniculatus L. - Birdsfoot trefoil, bird.s-foot trefoil, upright trefoil, common lotus. Family Leguminosae Endl., genus Lotus L.
Glabrous to sparsely pubescent perennial plant, though not a long-lived perennial; lifespan ranges from two to four years. The plant root system consists of a deep tap root with numerous secondary roots with good lateral spread. Roots can produce new shoots. Growth form ranges from prostrate to erect with numerous stems (10-60 cm) arising from a basal, well-developed crown and branches arising from leaf axils. Primary growth comes from the crown, but re-growth comes from buds formed at nodes on the stubble left after defoliation. Leaves are pentafoliate, alternately on short stalks with the two leaflets at petiole base resembling stipules. The asymmetrical, pointed leaflets are mainly glabrous and more slender and paler green than those of greater lotus. Inflorescences have up to eight flowers and are umbel-like cymes at the end of long, auxiliary branches. The calyx is a dentate tube, and the yellow, five-petalled corolla is often tinged red. The flowering period is indeterminate; consequently, seed develops over an extended period in summer. Seed pods, 2-5 cm long, contain l5-20 seeds attached to the ventral suture; the seeds are released by a sudden split of the pod along both sutures after one to two weeks of ripening, during which the pods change from green to brown. The seeds vary from round to oval in shape and from greenish yellow to dark brown in color. Flowers in June-September. The self-sterile plants are cross-pollinated, mainly by honey bees. Birdsfoot trefoil is a tetraploid with a chromosome number of 2n=4x=24, though diploid types have been identified. Introduced into culture in the beginning of the 19th century. Cultivated on relatively small parcels of forest and steppe areas in 38 regions and republics of former USSR countries. 8 breeding cultivars have state permission for utilization. A pioneer, perennial legume adapted to wet, acidic (pH 4.5-8.2), infertile soil conditions. Has a moderate degree of tolerance to soil salinity. Moderate degree of drought resistance. It tolerates waterlogged soils. Intolerant to shading from other plants, particularly during establishment. Is a long-day plant requiring day lengths of over l6 hours for full flowering. Tolerates poor soil drainage and is more tolerant of flooding than lucerne, but not highly tolerant. Winter hardiness depends on cultivar provenance. Russian cultivars are the most tolerant of low temperatures but are adversely affected by severe winters with fluctuating temperatures. 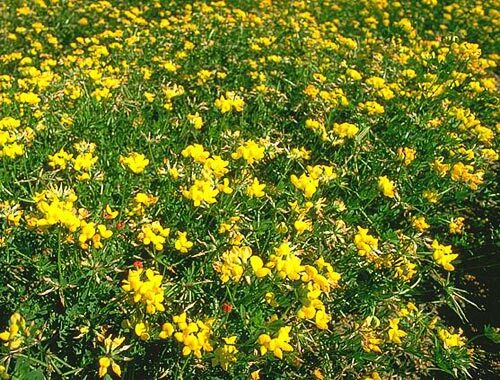 Birdsfoot trefoil is used as an excellent, non-bloating forage, and provides good pasture, hay, and silage for horses and cattle. It is especially good on infertile, poorly drained soils, and on soils that are otherwise difficult to cultivate. Although only one-third of the DM accumulates by the late vegetative stage, more than half the maximum amount of nutrients accumulates by then, and leaves generally have a higher mineral content than shoots, especially after the start of flowering. The rate of decline of forage digestibility is greater in late than in early season. The overall forage quality under drought conditions is better than that of lucerne due to higher leaf-stem ratio, delayed maturity, and improved quality of all plant components. The presence of condensed tannins in the leaves and stems prevent bloating in ruminants and are nutritionally advantageous, as they protect plant proteins in the rumen from degradation, thus allowing more protein to be utilized in the small intestine. The types and combination of essential amino acids in birdsfoot trefoil are optimal for the production of high quality animal products. The nutritional value of condensed tannins depends upon their concentration in the forage; levels of 20-40 g/kg DM are thought to be beneficial. Forage mass productivity ranges from 18-35 MT/ha, hay productivity ranges from 4.5-7.5 MT/ha, and seed productivity is 200-400 kg/ha. It is an excellent source of nectar and pollen for honey bees. Catalog of state-permitted cultivars of agricultural crops. 1969. - M.: Kolos, 489 pp. (in Russian). Catalog of state-permitted cultivars of agricultural crops. 1971. - M.: Kolos, 488 pp. (in Russian). Catalog of state-permitted cultivars of agricultural crops. 1974. - M.: Kolos, 480 pp. (in Russian). Catalog of state-permitted cultivars of agricultural crops. 1985. - M.: Kolos, Vol 3. - 489 pp. (in Russian). Golovkin B.N. 1988. Cultigenic plant area. - M.: Nauka, 184 pp. (in Russian). Kashtanov A.N., ed. 1983. The Natural-agricultural regions and utilization of soil resources of the USSR. - M.: Kolos, 336 pp. (in Russian). Medvedev P.F., Smetannikova A.I. 1981. The forage crops of European part of the USSR. - L.: Kolos, 336 pp. (in Russian). Shashko D.N. 1967. Agroclimatic region of the USSR. - M.: Kolos, 335 pp. (in Russian). Shashko D.N. 1985. Agroclimatic resources of the USSR. - M.: Kolos, 248 pp. (in Russian).